This week we are featuring the New England Sampler edition of Moto-Maps Back-Road Touring Guides. This edition features seven scenic motorcycle rides that explore the back roads of New England. These ride loops are a sampling of what is available to you as a motorcyclist riding in seven of the New England states. If you are visiting the northeast, get this edition of Moto-Maps to help llan your trip. Moto-Maps compact size make them a great stocking stuffer for the motorcyclist in your life. They are also a great tool for Road Captains. This week we are featuring the Best of the Smoky Mountains edition of Moto-Maps Back-Road Touring Guides. This edition features seven scenic motorcycle rides that explore the back roads of the Smoky Mountains. These are some of the most popular ride destinations in the United States including Deals Gap and The Blue Ridge Parkway. If you are taking a motorcycle trip to the Smokey Mountains you should make sure to get this back-road touring guide. This week we are featuring the Maryland & Delaware edition of Moto-Maps Back-Road Touring Guides. This edition features seven scenic motorcycle rides that explore the back roads of Maryland and Delaware. 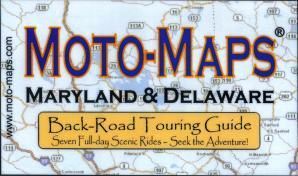 If you are taking a motorcycle trip to Maryland or Delaware you should make sure to get this back-road touring guide. This week we are featuring the Maine edition of Moto-Maps Back-Road Touring Guides. This edition features seven scenic motorcycle rides that explore the back roads of Maine. If you are taking a motorcycle trip to Maine you should make sure to get this back-road touring guide. This week we are featuring the Georgia edition of Moto-Maps Back-Road Touring Guides. This edition features seven scenic motorcycle rides that explore the back roads of Georgia. Start locations include McCaysville, Calhoun, Atlanta, Columbus, Fort Valley, Waycross and Savannah. If you are taking a motorcycle trip to Georgia you should make sure to get this back-road touring guide. “Where to ride?” is the question and “Moto-Maps®” is the answer! This week we are featuring the Eastern New York edition of Moto-Maps Back-Road Touring Guides. This edition features seven scenic motorcycle rides that explore the back roads of Eastern New York. Start locations include: Sackets Harbor, Lake Placid, Lake George, Saugerties, New paltz and Carmel . If you are taking a motorcycle trip to New York you should make sure to get this back-road touring guide of the eastern portion of the state. I own this Moto-Map and have been on most of the Carmel route which includes two of my favorite roads: Seven Lakes Drive and Route 301. Moto-Maps compact size make them a great stocking stuffer for the motorcyclist in your life. Order them today.